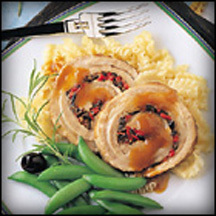 CooksRecipes has quality, kitchen-tested recipes for veal rolls and roulades that you can count on for successful deliciousness. Boneless veal breast is a superb choice for a company meal, especially when stuffed with a spicy fruit filling and braised in Madeira. An impressive entrée perfect for a special meal. Veal breast stuffed with a fresh rosemary, garlic and mushroom filling. 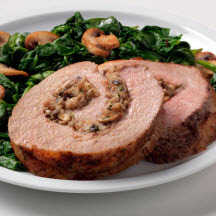 An elegant entrée of veal breast, stuffed with an olive and mushroom filling, is browned and braised in Marsala and served with a reduction sauce.